Watermelon is summertime. There isn’t a better fruit to contrast and cut through the hot, muggy weather. It’s commonly eaten in slices, chunks or balls. However, there are many fine recipes that turn the ordinary melon into an extraordinary salad. From sweet to savory, and everywhere in between, the following watermelon salad recipes are sure to spruce up your summer barbecues! A sweet and savory salad, this recipe blends tomatoes, watermelon, red onion, red wine vinegar and olive oil. A mix of salty and sweet, this salad mixes ripe watermelon with red onion, limes, feta, parsley, mint, olive oil, black olives and black pepper. This salad is a brilliant Asian salad that pairs chicken grilled with lemongrass and then tosses it with watermelon and a dressing of chiles, garlic, lime juice and fish sauce. Two of the most refreshing ingredients in one mouth-watering salad! Mix your cukes with watermelon and a light tangy dressing. Grilling the watermelon creates amazing caramelized markings that contrast nicely with the savory dressing. Anything from Ina Garten is delicious! Her salad uses a lemony dressing with shaved parmesan. Another Thai inspired salad featuring delicately roasted prawns in a savory Thai dressing. This is the most savory of all the savory watermelon salads: green onions, red pepper, garlic, ground mustard and pepper! A mix of watermelon, mangoes, crunchy jicama, cilantro, lime and honey. Mouthwatering! Deliciously simple, with only three ingredients. Watermelon tossed with freshly chopped basil and extra virgin olive oil. 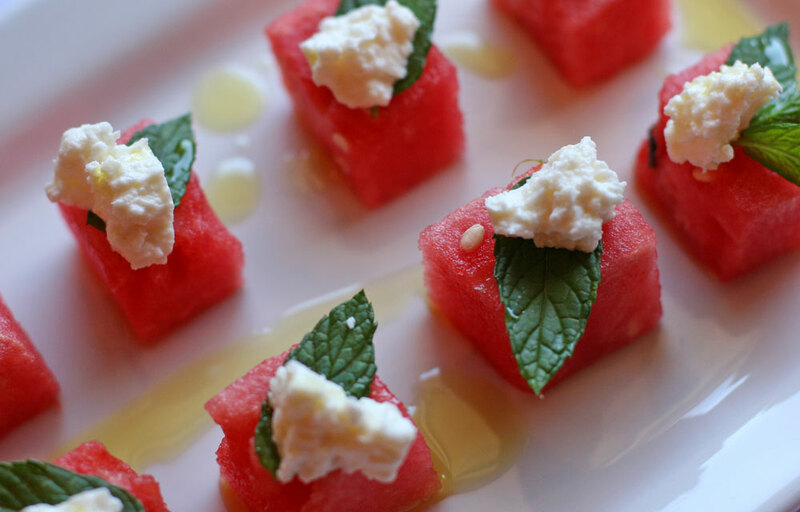 Cubes of fresh watermelon topped with a soft cheese and sprig of mint, then drizzled lightly with olive oil. was slightly freaked out that it reminded me of a portobello mushroom though?? ?